I trust everyone has had happy and healthy holidays? We spent xmas day with friends here on The Yard and we're only kinda recovering... don't know about anyone else, but these post-xmas-pre-new-year days can be a bit strange! Aran's fully into the swing of the whole present receiving thing, and keeps insisting that Babbo Natale has yet more presents to deliver for him. This year's haul was pretty impressive - DVDs, books, a personal computer in the shape of Lightening McQueen (that plays all sorts of brain exercise games), trucks and model cars, an abacus and much, much more. 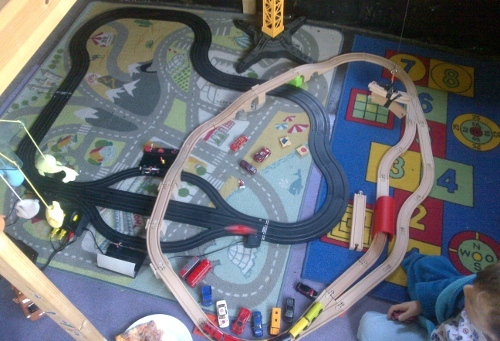 The favourite though seems to be the wooden train track that we picked up in Ikea, and we can easily add to it in future, too (hint, hint). As for us grown-ups, we did treat ourselves to the odd little bits that we've not bought throughout the year (new zoom lens for my camera, new processor for Tom's PC etc) and all of it is currently stuck in the UK, which means we'll have fun with that little lot in the new year. We did though receive matching slippers from my mum, same size and same colour so that we can't argue (Tom's only half a size bigger than me and he's always stealing my stuff), and we both agree, they're the most comfortable things we've ever put on our feet. With bacterial beating lining, too. I do hope you've all had a great time so far! Me, I'm looking forward to the New Year - it's always my favourite celebration. And I can't wait to see the back of 2011, it's been a bit of a rotten year. ps/ Tom's queried a phrase or two from today's post, hinting that it sounds a little... harsh. Hmm. Maybe my turn of phrase is bit off or Tom's not quite on the same page today, but either way, I've edited to sound a little less dry. What was that again about these few days being a bit strange? Newer:Getting ready for 2012Older:Seasonal Greetings!